If you’re also in the camp that thinks George Bernard Shaw was endlessly verbose, you’re in for a treat at Wilmington Theatre’s neatly boxed production of three short, sharp and funny playlets at the Old Red Lion. It’s as though the old boy gave up worthy polemical drama and started to write for ‘Smack the Pony’ as these extended sketches tackle marital fidelity, uppity women, wife swapping and the contrasting moralities of London and ‘the country’ from a perspective you simply wouldn’t expect of a dramatist born in the 1850’s. In ‘Overruled’ itself, two adulterous couples bicker with each other and eventually agree how to swap partners: it’s rammed with epigrammatic banter and you’ll wonder whether Noel Coward read it before writing Private Lives, the speech rhythms are so similar. Polina Kalinina’s directing is pacy and admirably well-focused, the company of six actors are universally fine: Lucy Hough especially so as the shop assistant and architect of her own future in ‘Village Wooing’ and Leo Wyndham delivering two excellently differentiated variations on foot-shuffling awkwardness as callow young romantics. Emma Bailey‘s set is elegant and clean, washing the backgrounds in cool blue-grey and cream, with very good furniture and props, and the ladies’ costumes are beautiful – perhaps a touch too revealing for an Edwardian cruise ship although gents in the audience didn't seem to mind and with the temperature in the auditorium most of us would gladly have stripped down to our pants. 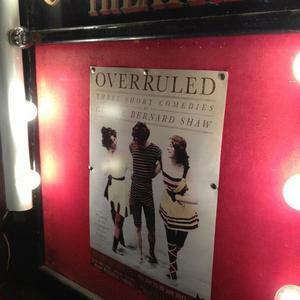 Overruled continues at the Old Red Lion Theatre Islington until 19 January, Tuesday to Saturday at 7.30pm, Saturdays and Sundays at 3.00pm. Tickets £10-15 and ‘pay what you can’ on Tuesdays. Box office on 0844 412 4307 or tickets online through the Angeltix website with £1.50 fee. Even in January, the theatre gets quite warm so dress accordingly.